The Roanoke Region continues to be a leading location when it comes to quality of workforce. For the fourth year in a row, Roanoke has been recognized by Area Development Magazine in its Leading Locations for 2015 feature for having a strong workforce. Roanoke was ranked 135th out of all 373 metro areas, placing Roanoke in the top 36 percent. And that’s no surprise to those who are hiring workers from the Roanoke Region. Our labor draw attracts workers from areas within a 60-mile radius. Pair that with a high concentration of colleges and universities and training programs, new highly-skilled people are joining the workforce every day. Education was one ranking consideration with factors such as the proportion of workers 18 to 44 with a college degree, inward migration of individuals with degrees, unemployment, and growth in earnings. Roanoke’s performance was strongest in regard to attracting college-educated workers, ranking in the top third of U.S. metros. With 25 colleges and universities within an hour of Roanoke and a higher number of undergraduates per capita than Austin, TX; Boston, MA; San Francisco, CA; and Research Triangle, NC; the Roanoke Region is a great place to find talent. The talent pool is growing in Roanoke. 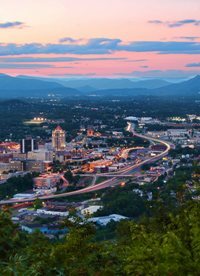 Area Development ranks Roanoke above several southern metros for prime workforce growth. Learn more about the Roanoke Region’s workforce talent.